Though the Jostedal glacier had bucked the trend by advancing throughout much of the last decade, the glacier’s winning streak came to an end in 2006 when it began retreating alongside its icy brethren. Once inside, the cavernous dome measures up to eight meters in height, 30 meters deep and 20 meters wide. 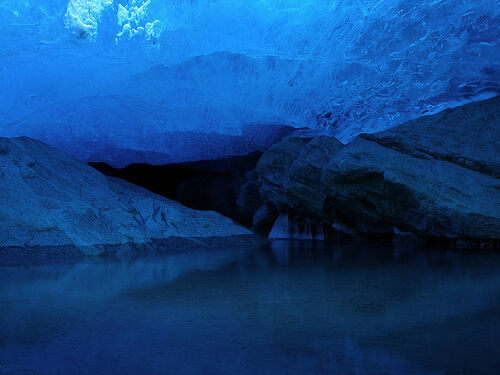 Its water and ice formations appear in deep crystalline blues, while the ceiling is punctuated by large icicles. 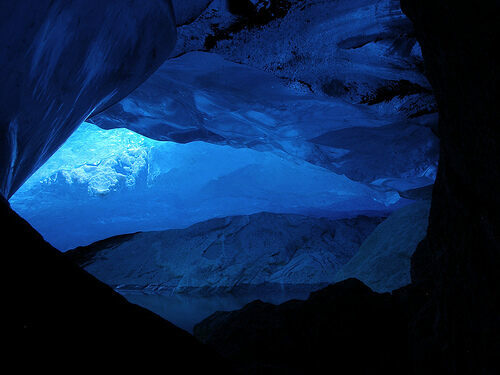 Due to the literally fluid nature of the ice, the cave’s appearance is constantly changing. Experts have attributed its unparalleled formation as an bi-product of glacial melting resulting from a steadily warming climate. Huge amounts of water melting from the glacier continue to erode the its innermost surfaces. The lagoon within the grotto simultaneously accumulates the runoff, while encouraging further melting as it ever-so-slightly warms the air trapped within the cave. Despite its location on one of the most easily accessible glaciers on Earth, the Nigardsbreen grotto is not to be entered by the general public without a guide. This is particularly the case throughout the summer months when warm temperatures and an active melting cycle dramatically increase the likelihood of the cave’s collapse. There are access roads to the park from many of the surrounding valleys, including Jostedalen, Veitastrond, Fjærland, Stardalen, Oldedalen and Lodalen. Exit Rv55 Sognefjellet Road at Gaupne and go north on Rv604. From late June to early September, No 160 (Jostedalsbrebussen) runs between Sogndal and the base of Nigardsbreen glacier. Check schedule for departure and arrival times. A ferry shuttles visitors across the lagoon to the glacier face from mid-June to August. Accommodation can be found at camp sites, guest houses and hotels in the valleys outside the park. Cabins within the park are accessed by foot (a few hours hike) from the main roads. An intricately carved Viking church overlooks a glistening fjord.